Georgia’s first lady Marty Kemp toured the Veterinary Teaching Hospital at the University of Georgia on Feb. 18, along with her daughter Lucy Kemp, UGA President Jere W. Morehead and several others. 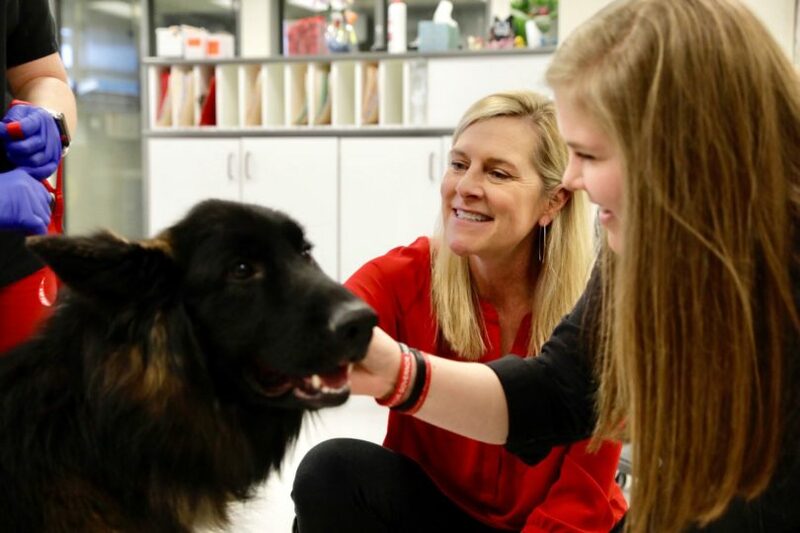 Kemp, who has loved animals ever since getting her first horse, Flare, at a young age, is no stranger to the UGA College of Veterinary Medicine hospital. In 2006, she brought in a foal named Loula, who had reared up, fallen back and broken her tailbone. “It made her drag her left back leg,” recalled Kemp. “The vet came and said you need to get this foal to the vet school immediately or she’s going to die.” They brought her in and she was there for five or six weeks. Kemp would come and see her every day. During her stay at the teaching hospital, her care team discovered that the foal had a blood disorder, one that would have killed her if she hadn’t been brought in for the tailbone. Today, Loula is alive and well on the Kemps’ farm. Kemp has also brought two animals to zoological medicine: a bunny she rescued from the mouth of one of the family’s Labradors, and a duck that had died. The tour led Kemp through the small animal teaching hospital, where she got to meet a puppy about to undergo surgery, and the zoological medicine area, where a giant anaconda was being treated. 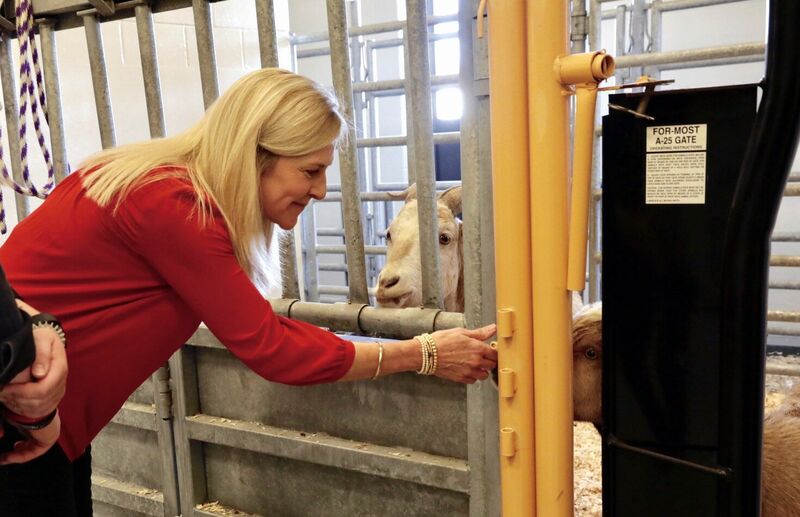 It also included the parts of the hospital used for diagnostic imaging, the food animal treatment center, and the equine performance arena, where horses are checked for lameness and other ailments. One her daughter Lucy recalled with particular fondness is a goat named Kenny Chesney. When the human Chesney was in town, Lucy and her mother saw the tour bus downtown and relayed the fact of their goat’s name to Chesney’s people. They asked her to bring the goat to them, so they did, and Chesney himself got off the tour bus to meet the goat and Lucy Kemp. Lucy, a senior in high school and also a lover of animals, is interested in UGA’s veterinary medicine program. Kemp is still in the process of working out what she wants to focus on during her tenure as first lady of Georgia, though she is certain animal welfare will play a role because it is a cause so dear to her heart.